I found a couple threads but there wasn't anything recent so has anything changed lately in terms of a good looking lexan body to become a runner shell? Had the same problem as I've recently finished my Bullhead chassis. I'm a bit afraid of ruin the Bullhead body because I'm planning not to paint box-art and this will take some time. Therefore I've ordered a Proline 1980 Chevy Blazer lexan body. Arrived yesterday and looks pretty cool just laying on the chassis. Wheelbase is with 285 mm slightly longer but it is not really noticeable. I've decided to paint it yellow and probably silver. The only thing I have to figure out is the rear body mount as this is not a pick up. Maybe I will mount it on the back or the side of the body. 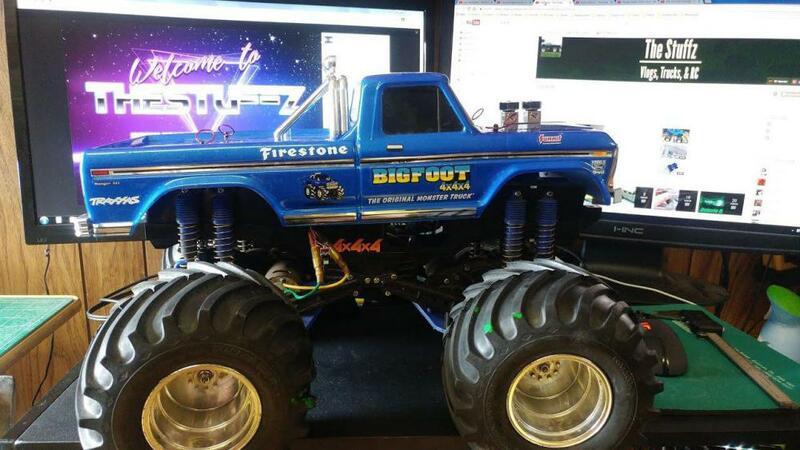 J Concepts 80s Ford (big foot) or Chevrolet (USA1) bodies available at modelsport are designed for the clod chassis. One of the few correctly scaled. Wheelbase is rather short on the Clod/Bullhead so most Proline and other crawler pickup bodies will just not look right. JConcepts makes a lot of 10.5" wheelbase specifically for the Clod so that will be your best bet. Does the Bullhead have the same bodyposts as the Clodbuster? No, the Bullhead body post are shaped differently despite being bolted in the same locations on the chassis tub. Is that both front and rear? While pondering this purchase they (Modelsport) linked some other products for me to peruse... a hood blower, I am tempted to add that to the F250 just for some giggles. Yes, both front and rear post are different between the Bullhead and Clod Buster. Jconcepts also do an '82 GMC K2500 (Or Silverado or C/K2500 or however you decide to decal it up), and since the OG Clod body is based on an '80s Chevy K30 (with the same cab, hood line, and bed) I should think this ought to drop straight on the original Clod body posts. In theory at least. The promo photos even show the body on a Clod chassis with the stock chrome bumper sticking out. That's how close the two bodies are in terms of size and dimensions. Parma/PSE used to make a direct-replacement Lexan Clod body as well. Not sure if they're still available. But that JConcepts one looks very close to it. @GooneyBird as you’re such an expert on old trucks, is there any Clod sized body that could be made to look like a 1993-ish 454SS? Ideally a hard body. I want one and had thought about using a CPE grille of some sorts and using a Clod body but feel it’s a bit square to look right. Parma/PSE used to make a direct-replacement Lexan Clod body as well. They still do. It's on their website along with lexan versions of the Blackfoot, Monster Beetle, Lunch Box, Midnight Pumpkin and Grasshopper. I vaguely remember something going awry with Parma sales (possibly part of the Tower mess?, not sure) so they just started moving most of their product through their own website. If anybody knows the full story, I'm curious. Hard body? That might be tough. Even the old USA-1 body was lexan with chrome plastic add-ons (grill, rollbar, etc.) Jconcepts makes a 1988 Chevy body in Lexan that's a least the same body-style as the old 454SS. The big issue is the 454SS was a short bed truck and shy of doing something custom, most Clod bodies are long beds (Blackfoot F-150 excepted). I guess that's key to the look too, since what made the old 454SS special was the ability of getting a big block in a short bed 1500-series truck back then. The old TBI 454 itself was nothing much special at the time but getting it in the smallest, lightest fullsize truck variant was. 30hp more than the garden variety 350 in the regular models. I have a 93 ext cab short bed, and yes although I have thought about building a 1:10 of my truck, the long bed on the 1:10 bodies puts me off. Great for a monster truck, but that combined with unrealistic fenders, and the USA-1esque industrial front bumper means a lot of work to make a street truck. The Traxxas Bigfoot classic body fits and it’s easy to line up the posts. There is a guy that made a video on YouTube showing you how. Here is a picture of one from the internet. Yikes $32 to buy and $43 to ship to the UK.... pity this isn't sold in the UK as this would have been my preferred truck. @Saito2 you’ve hit the nail on the head there - that’s exactly why i want a hard body, so that i can chop it down to a short bed. I had thought on Blakfoot sized shells but with it being an F150 they all seem to be Ford-based. The Chevys / GMCs etc all seem to be aimed for Clods. .......ahhh mannnn the current TXT-2 & Super Clod prices make me want to reinvest in the hobby. Just had a big dig through my loft and I still have all the spares / electronics etc I need too. Glad to hear Parma is still around, even if with scaled-back distribution. They were such a big part of the slot-car scene and the formative years of RC that I would hate for them to get pushed out of business.